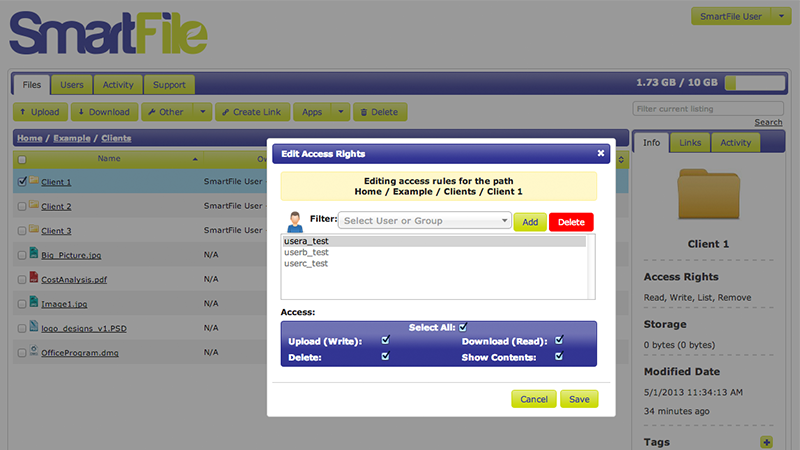 One of the most powerful features of SmartFile is the access permission system. Being able to set custom permissions gives you a whole new level of file security. This can come in handy when dealing with internal permissions between departments and the hierarchy of a company. Another great use-case is dealing with clients and ensuring that no client ever sees another client’s files. These are just a few examples of how you lock your files, folders, and users down! This process can be done in a variety of ways, from setting permissions globally on a file or narrowing the scope to an individual user (or group). In this tutorial, I will walk you through how to set up parent and subfolder permissions to reflect different access rights for different users. *Note – Subfolders inherit parent folder permissions by default, but you can manually modify them to whatever you want! Here is the scenario: Company A wants to give 3 clients access to the same parent folder, but restrict their permissions to only view and read (download). In that folder, the clients will have their own subfolder (that only they can see), with full access permissions. So, client 1 will not see the other clients folders, they will not be able to modify the parent (home) folder, and they will have full permissions in the client 1 subfolder…here we go! Setup Users – Create (or edit) your client’s user. Make sure their “Directory” (or what we call the Home directory) is set to your parent folder. Click the “Advanced” link and change the permissions to only “Download” and “Show Contents”. Repeat this for the other client users. Change Permissions – Browse to your parent folder. Select one of the subfolders and click the “Other” dropdown, select “Access”. In this dialog, you will need to “Add” the three client users (or any other users). Once any user/group is added, they will have NO ACCESS RIGHTS. You have to then grant access to any user/group that you want to allow to see the selected subfolder. To do this, highlight the user and modify their permissions. Repeat & Enjoy – Repeat step 3 for any other subfolders. Enjoy the piece of mind of knowing your folders are set up specific for your clients without creating a monster folder structure. *Note – If you need to do this with a lot of users you can always create a “Group” and apply the permissions to the group while only modifying one individual user you want to give different access rights to. It’s that simple. You can set up different access permissions everywhere to ensure the right people are seeing (or not seeing) your files. If you have questions please leave a comment below. We’ll have more SmartFile 101 in the future, to help walk through these common scenarios. Happy sharing everyone! UPDATE – There have been a few questions regarding this post and how permissions work. So just as a preface, I’d like to clarify how SmartFile permissions currently work (as of September 2013, subject to improvement in the future). A user’s permissions are controlled by the granting of List, Upload, Download, and Delete. User permissions will always override any Group permissions that the user belongs to. Therefore, you can never grant additional permissions to users through a Group. A Group’s permissions will affect anyone in the group. If a user is assigned to multiple Groups and the Groups’ permissions are conflicting, then the last assigned Group’s permissions will override any other Group. A user always has full access to all subfolders and files within their home directory. If you want to limit access to specific files or folders within your SmartFile account, you will have explicitly deny access to ALL files/folders in that directory. To do this you will go through the ‘Access’ dialog laid out in the above tutorial and add users you want to deny access to(Step 3). We are always working on improving SmartFile, so this process will be improved in the future based on your feedback, suggestions, and comments. Please visit, http://feedback.smartfile.com and be apart of the conversation. Next Next post: What Sets SmartFile Apart from DropBox & Box?